A lovely screening + Q&A for “High Above The Sky” at the Cinema Museum by the One Reelers Film Club with surprise appearance by one of the composers Hutch Demouilpied. The screening paired early cinema short movies with contemporary short, including a Q&A with the filmmakers and experts. There is also a lovely networking event in-between screenings…and it was treat to discover the work of Percy Smith! The Venue is very charming, the staff lovely and the whole event a really good evening out. 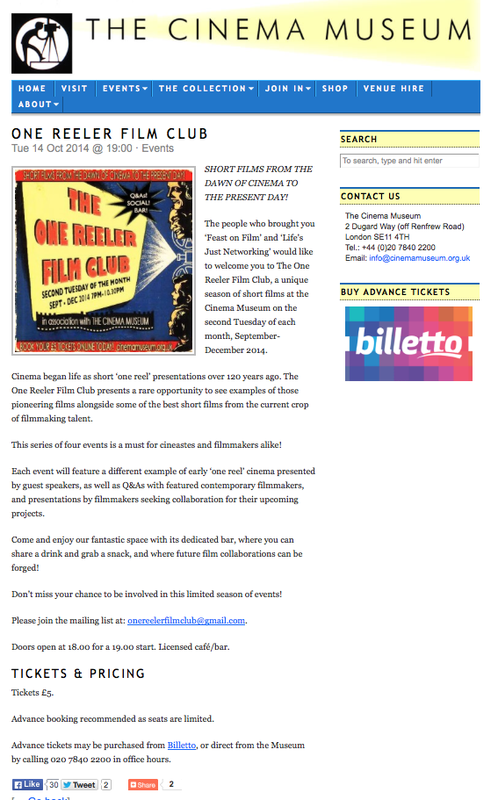 If you have a spare tuesday and you love shorts I urge you to go, all the info are below… plus some snapshots. 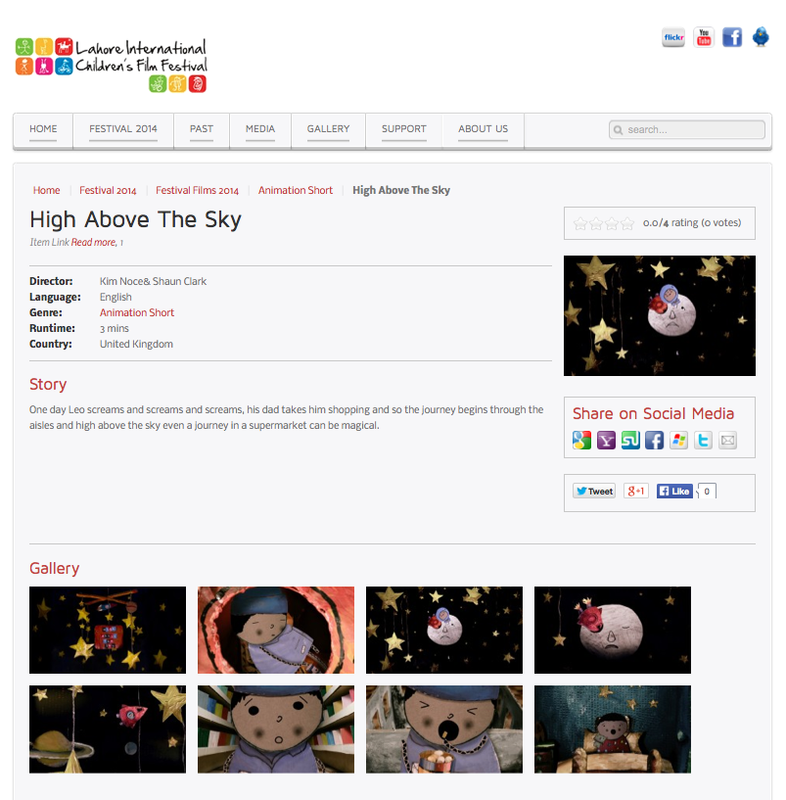 High above the sky will be screened at 6th Lahore International Children’s Film Festival 2014 in Pakistan! The idea to hold a children’s film festival was conceived by Shoaib Iqbal in 2007, when he was working with Ali Institute of Education (AIE), in order to promote arts education and learning through the arts in Pakistan. AIE supported the idea and prominent educationists from the organization helped in shaping the festival greatly. The festival grew each year with valuable inputs of a number of film makers, artists, sponsors, volunteers, and, most importantly, its audience, largely comprising children and young people. We are delighted High above the sky It will be screened August 3rd as part of Cinema Circus, the children’s big blow out event of the Martha’s Vineyward Film Festival in Massachusetts ! Here a little bit about the origin of the festival: In the middle of winter 2001, Thomas Bena and a group of friends were desperate for good movies. They had rented nearly every VHS tape and DVD at the local video store, and the two Island movie theaters were only showing mediocre blockbusters. Although Thomas had never even been to a film festival, he asked his friends to help him create an alternative movie experience—one that would feature fantastic films, exotic food, art, and music. He rented the Grange Hall in West Tisbury and found several independent filmmakers who were willing to let him present their work. With one small article in The Martha’s Vineyard Times and a heap of phone calls, four out of the five programs played to a full house. The projection booth doubled as a kitchen where curries were prepared just a few feet from the technical equipment. A series of interviews with Islanders played on television screens strategically placed in the bathrooms. Strangers talked, friends were made, people had a great time. The MVFF was born. We are delighted to announce High above the sky has been selected to screen at CAKE and has been shortlisted amongst two other films for Best Professional Animation. The filmwill be screened on 16th July at 4.45 and in the Best of the Festival and Awards Ceremony of C.A.K.E Festival Awards on Friday 18th 2:30pm CE, in the Lecture Theatre in Ormskirk, at Edge Hill University. 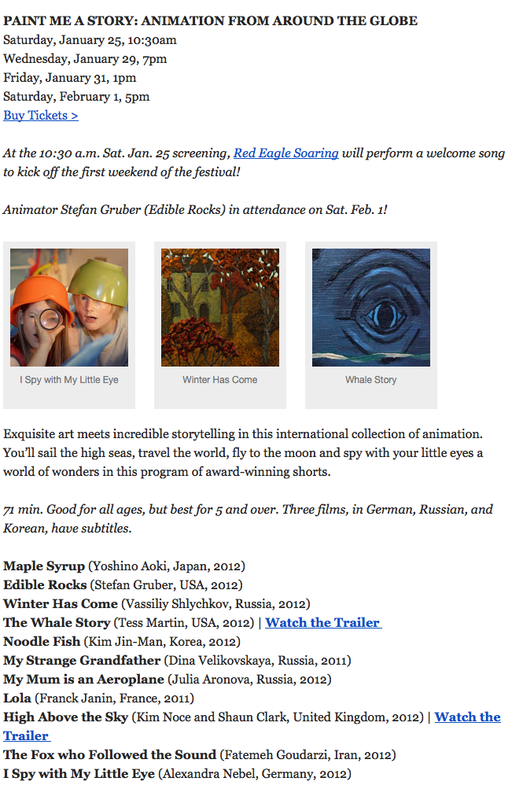 We are delighted to announce that “High above the sky” will screen at Supertoon this july in Sibenik ,Croatia. 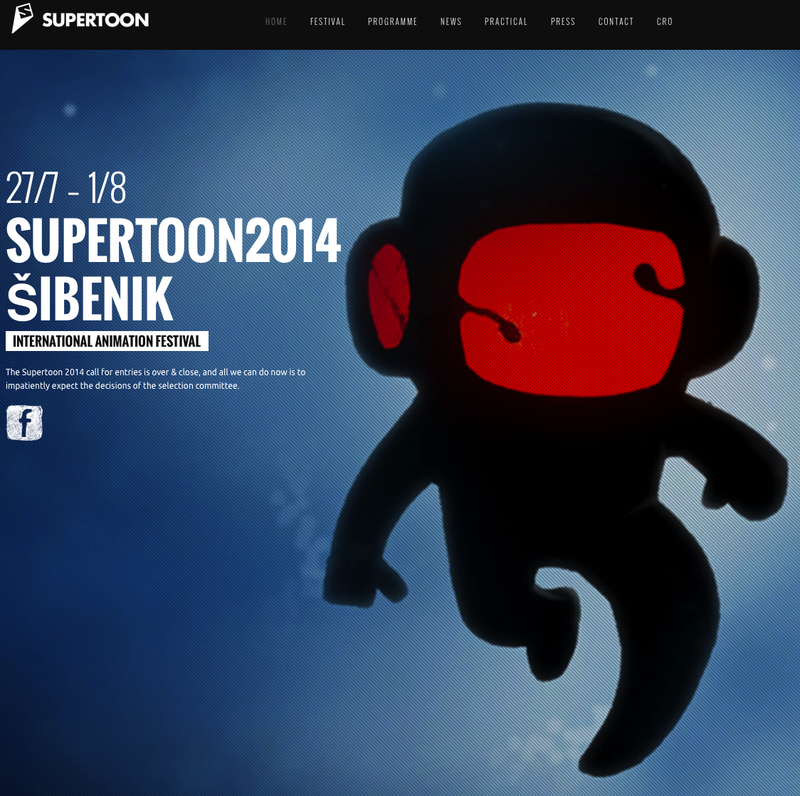 International animation festival SUPERTOON will be held in Šibenik from 27th July to 1st August 2014. Through displaying recent domestic and international production of short animated movies (movies of up to 30 minutes) and a series of competition and accompanying program, Festival provides a wider view of this artistic expression to adults and children, random visitors and film professionals. SUPERTOON creates space for direct communication between all interested parties – the authors, producers, journalists, students, providing them with opportunity to gather, exchange ideas and experiences, and provides the possibility of negotiating future cooperation. 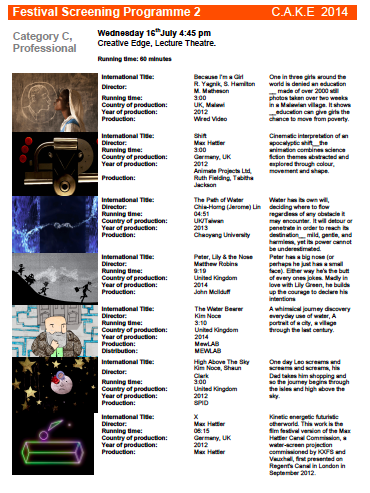 Short-format, non-commisioned animated films or videos. 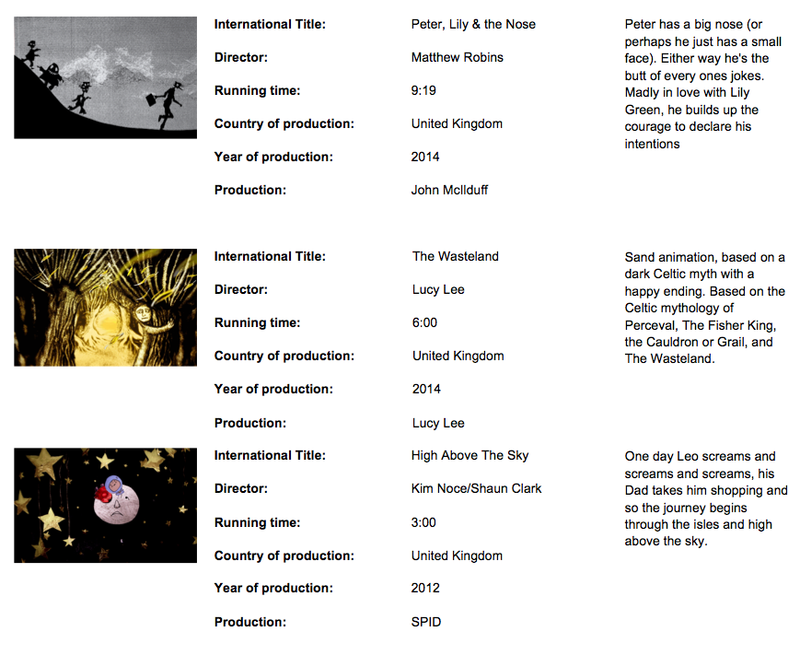 Animated works produced and distributed specifically for children audience. When a serial is the case, only one episode is eligible. Official music videos, commissioned animated videos made specifically to promote music pieces. Commisioned and aplied animation in the field of advertising or promotion. Feature films’ official title sequences. Films and videos are selected via international tender announced on the festival’s website as well as by direct calls to studios and producers. Received works will be selected for the official competition, and the international jury comprising of three members which will chose laureates in all categories. SUPERTOON’S rich accompanying program includes retrospectives of individual authors, animation studios and schools which goal is to enable visitors to discover or recall work that contributed to the development of animation in our country and the world. Side programmes have a strong educational role so through a series of events such as interviews with authors, lectures, exhibitions related to animation, animators and animation workshops for children visitors learn about the process of thinking and making films. High Above the Sky will screen at MEMPHIS BROOKS MUSEUM OF ART a non-profit art museum in Memphis, Tennessee, USA. 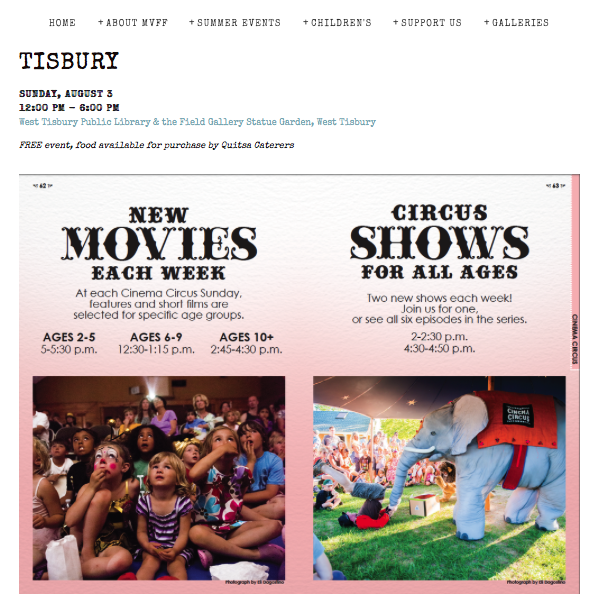 This summer, they are hosting a weekly family program on Wednesdays that includes hands-on art-making and children’s films, with free admission for everyone. This is the fifth year they have offered this free family activity, and attendance increases each year. In 2013, an average of approximately 425 people per event, each of which lasts for two hours total. With free admission, many visitors, children, families, and even daycare and summer camp groups are able to visit the museum and enjoy the programs. 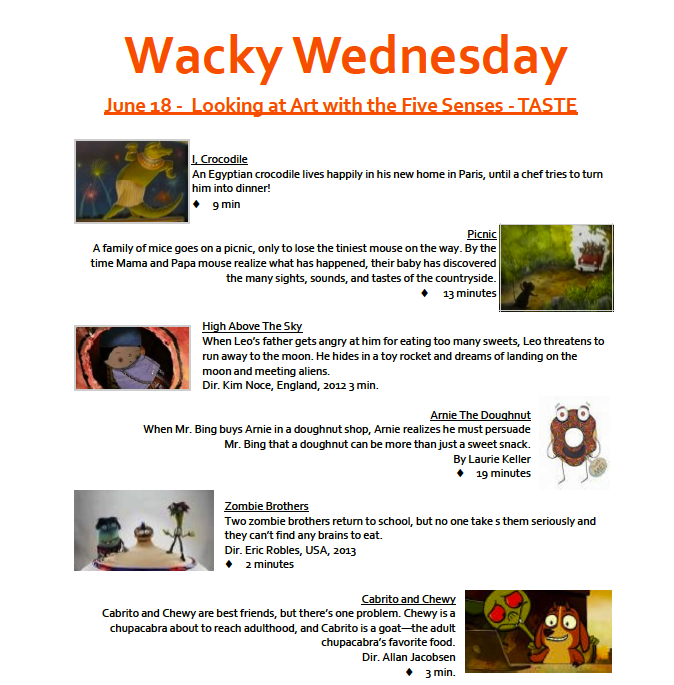 Each week will feature a different theme (this summer we are focusing on the five senses). High Above the Sky is on June 18th as part of Wacky Wednesday program. The event begins at 10am and ends at 1pm hosting more than 450 children . As part of Bird Eye View Film Festival, High Above the Sky will be screened at the BFI on the 13 April at 2.pm amongst 7 other short films including Joanna Quinn’s BAFTA-winning, Oscar® nominated FAMOUS FRED. A Short Animated Film by MewLab , produced by SPID THEATRE, funded by BFI, Kensington & Chelsea Borough and First Light. Over the past 8 years, Children’s Film Festival Seattle has become the largest and most respected film festival on the West Coast dedicated to children and their families. Each year, Northwest Film Forum selects more than 120 international children’s films from 35+ countries, reaching more than 10,000 people during festival screenings in Seattle and a subsequent festival tour of 15-20 U.S. cities. 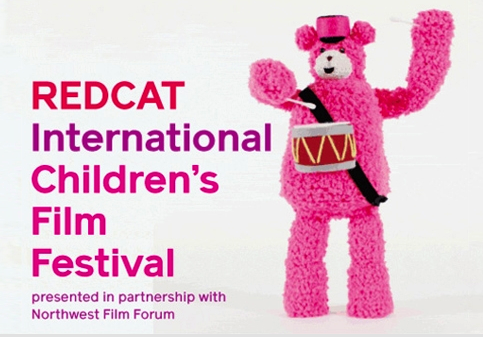 All films accepted in the CFFS will also be considered for the 2014 REDCAT International Children’s Film Festival, which CFFS director Elizabeth Shepherd has curated for the past 8 years. All over the world, filmmakers are crafting works of exhilarating imagination and creativity just for kids; Northwest Film Forum curates the best of these films and presents them to Seattle families. The 11-day extravaganza celebrates the best and brightest in international cinema for children, featuring live performances, animation, features, shorts and hands-on education workshops, all crafted with care to appeal to the next generation of movie lovers. By showcasing innovative, inspiring and fun films from around the globe, we promote delight, discussion and even debate while sparking interest in different languages and ways of life, as our young audience members leave with a better understanding of film as one of the greatest means of storytelling ever created. This year’s CICFF features the absolute best in world cinema — hundreds of films that will inspire and delight Chicago families. From October 25 through November 3, kids will take charge of cinema as they become the next generation of Chicago cinephiles and world citizens. The Festival features 288 films from 43 countries, selected from over 9000 entries. At the Festival, you and your family will explore new cultures and traditions with exceptional quality films and media, and take an amazing journey with a wealth of character-driven stories, painterly and cutting-edge animation, and thoughtful resolutions. The CICFF engages kids of all ages with post screening Q&As with filmmakers, interactive workshops with special guests, peer-to-peer dialogues, filmmaker-led seminars, and the CICFF Children’s and Youth Juries. 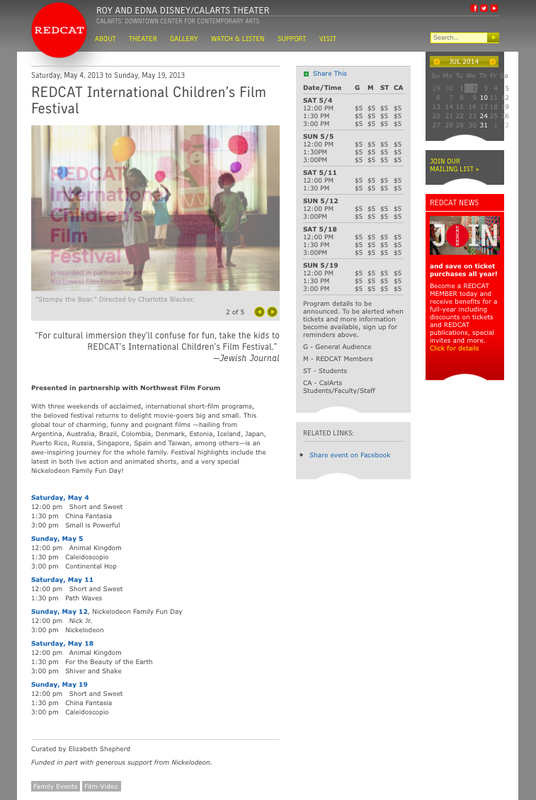 The Chicago International Children’s Film Festival is the largest festival of films for children in North America, welcoming 25,000 Chicago-area children, adults, and educators each year, and featuring over 250 films from 40 countries. The Festival screens a wide range of projects, from live-action and animated feature films to shorts, TV series, documentaries, and child-produced works. 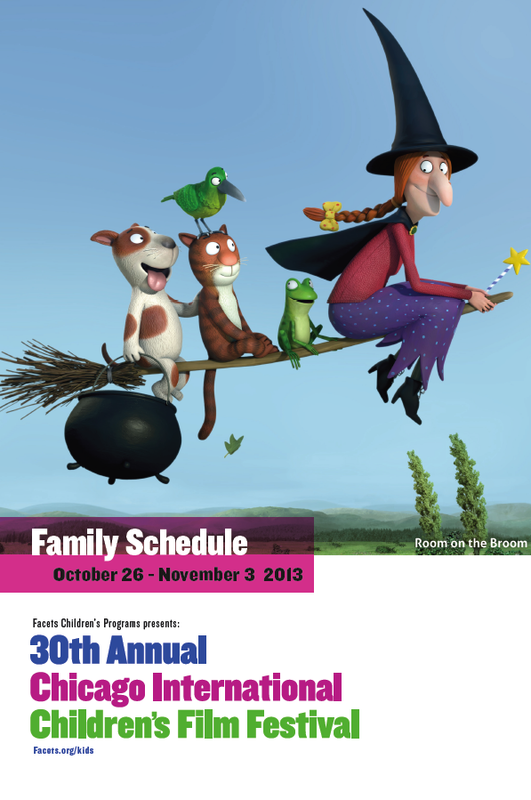 One of the most unique festivals in the country, the Chicago International Children’s Film Festival showcases the best in culturally diverse, non-violent, value-affirming new cinema for children, and is one of the only Academy Award qualifying children’s film festivals in the world. For more than 30 years, the Chicago International Children’s Film Festival has set new standards for what children’s festivals can achieve. As the largest and longest running children’s film program in North America, the Festival discovers the best in world cinema and continually raises the bar for quality children’s programming. Movies in the garden are short sessions of films followed by a conversation. After watching two short movies children are invited to question what they saw. These events were created to be outside the auditorium or cinema-theater, in a tent, in a garden surrounding, with a selection of carefully selected short films. The 1st edition of PLAY – Lisbon’s International Kids Film Festival will be from the 1st – 9th of February, 2014 at the Cinema São Jorge, Lisbon. This 1st edition already has the support of the Municipality of Lisbon, and EGEAC. 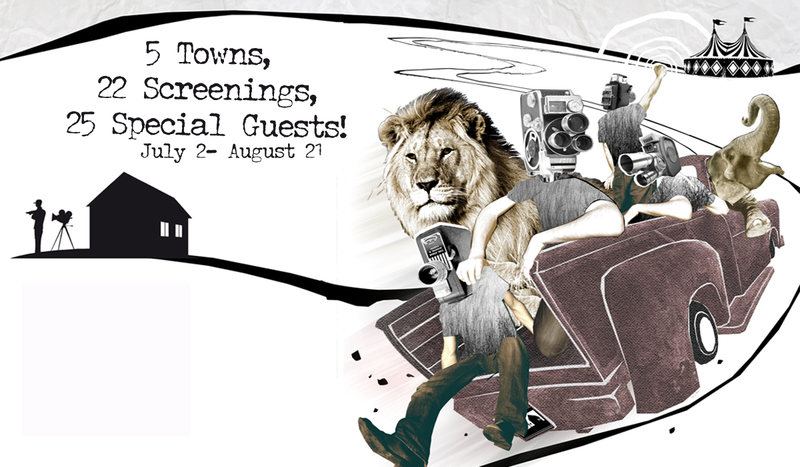 Each day of the festival will be organized around four screenings. During the week, the audience will be essentially the school network, and on weekends, young people and children accompanied by their families. There will be discussion sessions, stimulating critical perspective of these new viewers as well as the participation of creators, encouraging dialogue with the young audience, along with workshops for unique experiences. Throughout the year, the festival will extend to other parts of the country, through specific actions, traveling to regions where cultural programs are scarce. The relevance of this project relies on the assumption of the cinema experience as an openness to the world, taking the youngest to contact with the Other and experience other realities, so the Festival will be an area of ​​fruitful dialogue between Portuguese and international initiatives in the field of cinema. 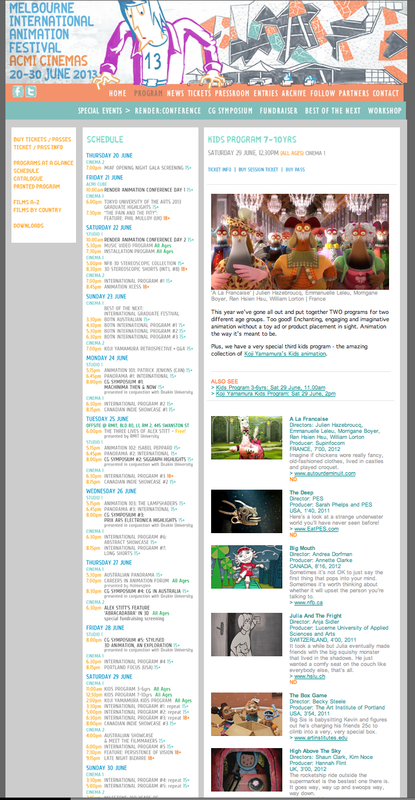 Founded in 2003, LIAF aims to dispel the popular misconception that animation is just cartoons for kids by screening the broadest possible range of intelligent, entertaining and provocative current films on offer from all around the world as well as retrospectives and specialised sessions from countries and animators who don’t normally elicit such attention. Our annual 10-day Festival includes gala premieres, retrospectives, Q&A’s with filmmakers, workshops, audience voting, and the Best of the Festival screening. LIAF has grown to become much more than an annual Festival – we are programming more events, tours, screenings and masterclasses all year-round to as many cities and countries that invite us. LIAF strives to be the best, and we do so with a very small, very dedicated staff. 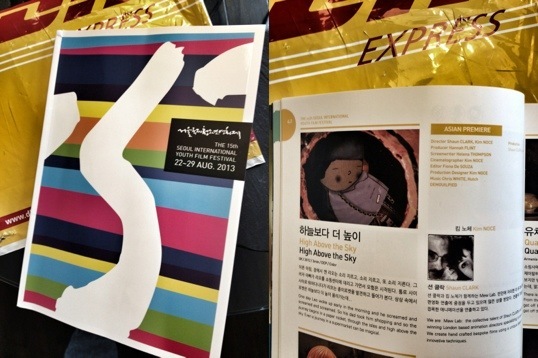 High Above the sky will be screened in october in an event for the promotion of the festival PLAY FEST – Lisbon Children and Youth Film Festival which will have place from the 1st to the 9th of February 2014. 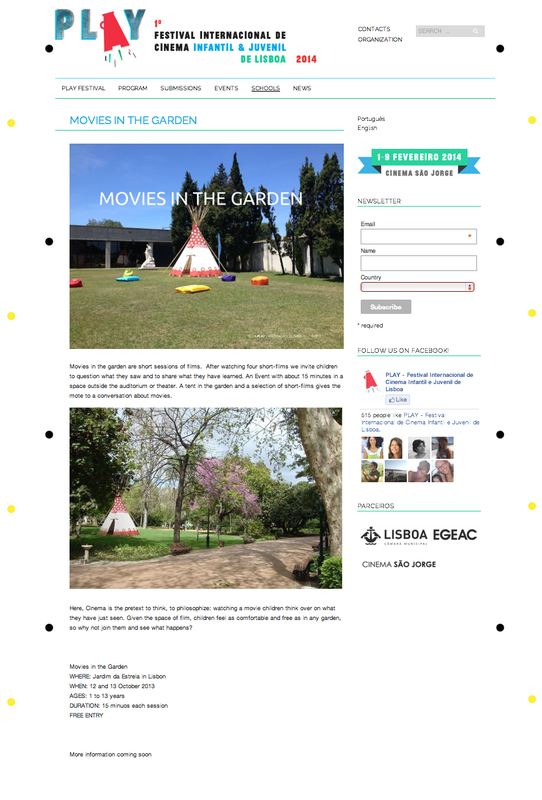 The event will consist in the exhibition of children’s films in a public garden in Lisbon, workshops and a fest celebrating cinema and childhood. Pentedattilo the festival in a ghost town! High Above the Sky has been selected to be screened in the ghost town in the fantastic Pentedattilo Film Festival is one of the most important Festival for Short Movies in Southern Italy. It will run on the 23-25 August. 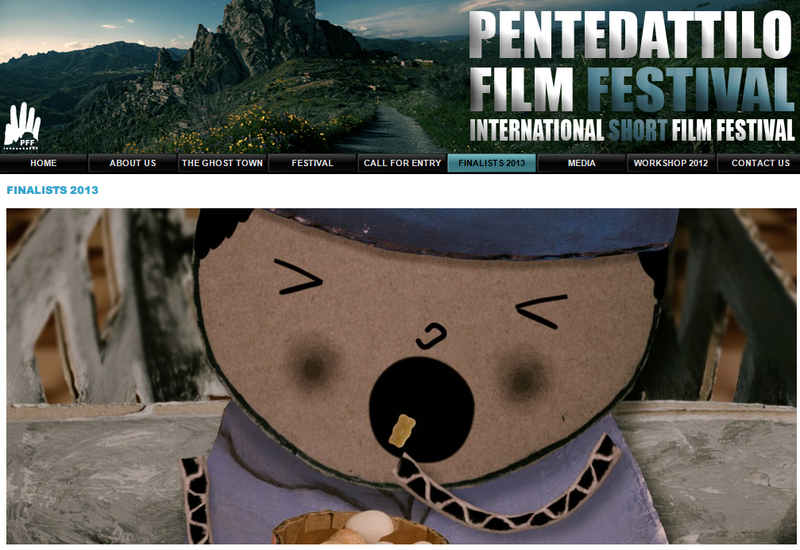 Pentedattilo Film Festival is held every year in the ancient ghost town of Pentedattilo, near Reggio Calabria. The village, defined by the nineteenth-century traveler Edward Lear “The strangest human dwelling place” is perched on a strange rock shaped as a giant hand, and it has recently experienced a cultural recovery that has made it one of the most significant destination for the spread of international short films. The PFF, born in 2006 in the ghost town of Pentedattilo, Italy, by a group of filmmakers and produced by ‘Ram Film’ and the ‘Associazione Pro Pentedattilo’, aims to give visibility to the most recent production of short films and to foster ideas and artistic exchanges; whereas the awards are an encouragement to the authors who invade each year a place that represents an emblem of change and creative sharing. It is actually during the days of the festival that the ghost town of Pentedattilo turns back to life: the sole source of light in the steep narrow streets is the light of the short films screened in the old houses. We fill the ancient farmhouses, the small squares, the open spaces with the stories of hundreds short movies. We annually recover an abandoned town to let it become a symbol of a virtuous union between cinema and territory. And if the location isn’t inspiring enough…there is also history, murder and illustrious travellers , such us Edward Lear, who visited the town in 1847 and described it in his diaries. High Above the Sky has been selected to be showcased in AWESOME International Arts Festival For Bright Young Things which runs annually in Perth, Western Australia. High above the Sky has been selected to be showcased at MIAF in the Kids Program 7 – 10 Years: Sun 29 June, 12.30pm , and will tour all around Australia! The Melbourne International Animation Festival or MIAF is an annual animation festival held in Melbourne. Supported by the Australian Centre for the Moving Image, the Australian Film Commission and the Melbourne City Council, it is Australia’s largest animation event. 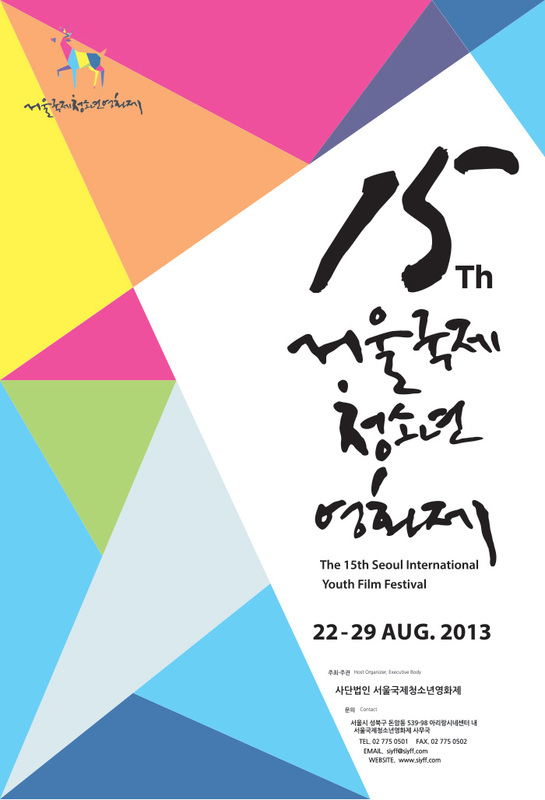 Over the course of the festival more than 200 films from over 30 separate countries are shown. 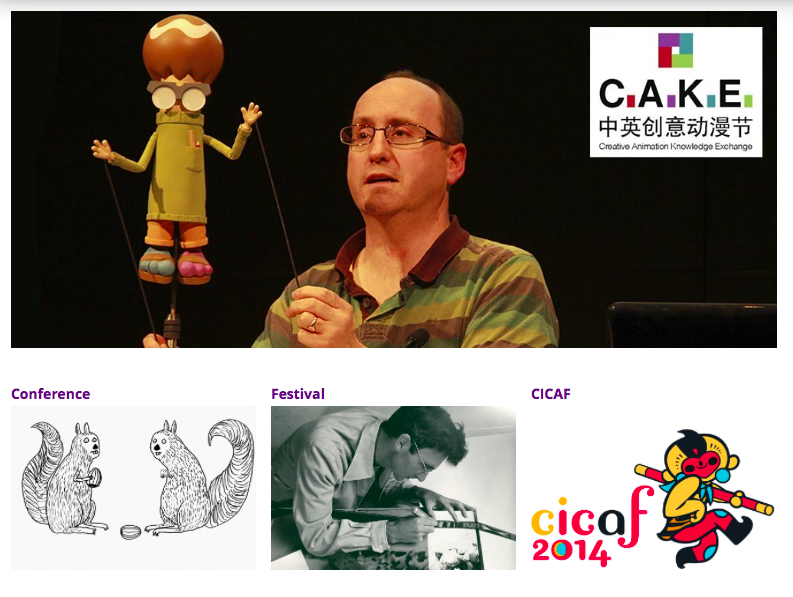 Highlights of the festival include many guest artists and visiting animators, from both local and abroad. . The festival has attracted increasing international respect and recognition while progressing the unique visions of talented animators and their teams worldwide. MIAF13 is going to be a whopping eleven day celebratory feast of forums and over 400 of the best recently released, historical and retrospective animation from around the world. As a part of MIAF13, we’ll be launching RENDER: a 2 day animation conferenceand a jam packed CG symposium – and introducing a host of special guests, including master animator Koji Yamamura and Canadian indie animator extraordinaire Patrick Jenkins. Then of course there’s our annual promise to showcase award winners, outstanding industry veterans, inspiring independents, studios and newcomers. We will promise fearlessly uncompromising programs to inspire and challenge, and will undoubtedly become the centre of the animation universe!! This year we’ve gone all out and put together TWO programs for two different age groups. Two programs. Too good! Enchanting, engaging and imaginative animation without a toy ad or product placement in sight. Animation the way it’s meant to be for our most discerning audience. Seoul International Cartoon and Animation Festival (SICAF), which marks its 17th anniversary this year is establishing itself as one of the leading global festivals featuring the world’s best cartoons and animation contents, extending well beyond the Republic of Korea and Asia. At the time of a revolutionary paradigm shift in media platforms, the 21st century’s cultural contents industry is emerging as a changing paradigm and striving to provide world-class contents with competitiveness by breaking down boundaries among genres and transforming wide imaginations into reality. In modern society troubled by lack of communication, cartoons and animations, which can communicate with different age groups and can be freely converged with their highly extendible characteristics, are drawing attention as one of the core contents of the culture industry. SICAF2013 is one of the most representative cartoon and animation festival, which endeavors to realize a cultural festival that all generations can enjoy and empathize with. Especially, SICAF, which will be held in Myeong dong and namsan this year, will become a cultural complex street festival creating a new cultural value. It will also become a venue to infuse the public with cultural imagination and to provide new inspiration and networks for experts in these fields. With three weekends of acclaimed, international short-film programs, the beloved festival returns to delight movie-goers big and small. This global tour of charming, funny and poignant films —hailing from Argentina, Australia, Brazil, Colombia, Denmark, Estonia, Iceland, Japan, Puerto Rico, Russia, Singapore, Spain and Taiwan, among others—is an awe-inspiring journey for the whole family. Festival highlights include the latest in both live action and animated shorts, and a very special Nickelodeon Family Fun Day! Through performances, exhibitions, screenings, and literary events, REDCAT introduces diverse audiences, students and artists to the most influential developments in the arts from around the world, and gives artists in this region the creative support they need to achieve national and international stature. REDCAT continues the tradition of the California Institute of the Arts, its parent organization, by encouraging experimentation, discovery and lively civic discourse. 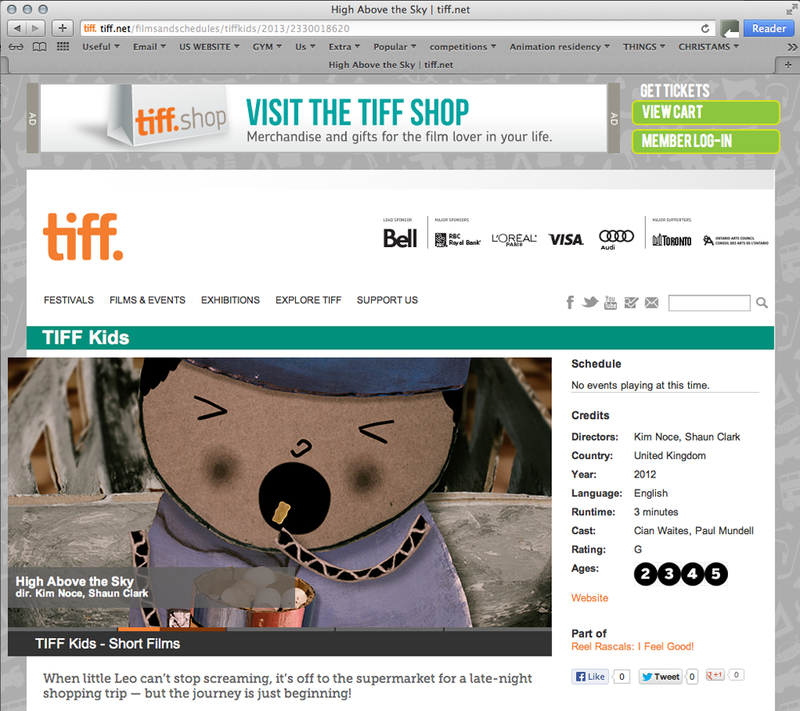 High Above the Sky has been selected in the main competition of TIFF Kids, if you live around Toronto and have kids you can have a peak at the film on the schedule here. The Toronto International Film Festival is the leading public film festival in the world, screening more than 300 films from 60+ countries every September. With reputation for excellence, and a diverse array of films are shown: Hollywood galas, complete with red carpet glamour; the best in international cinema, the latest homegrown comedies… and everything in between. TIFF Kids offers a diverse slate of films from Canada and around the world — films that take children and parents out of the everyday, and use the power of film to foster thought and encourage discussion about the complex and challenging issues facing young people today, and have lots of fun doing it. Whenever possible, screenings include an opportunity to engage in discussions with filmmakers and special guests to further explore the film’s ideas, themes, storytelling techniques and much more. 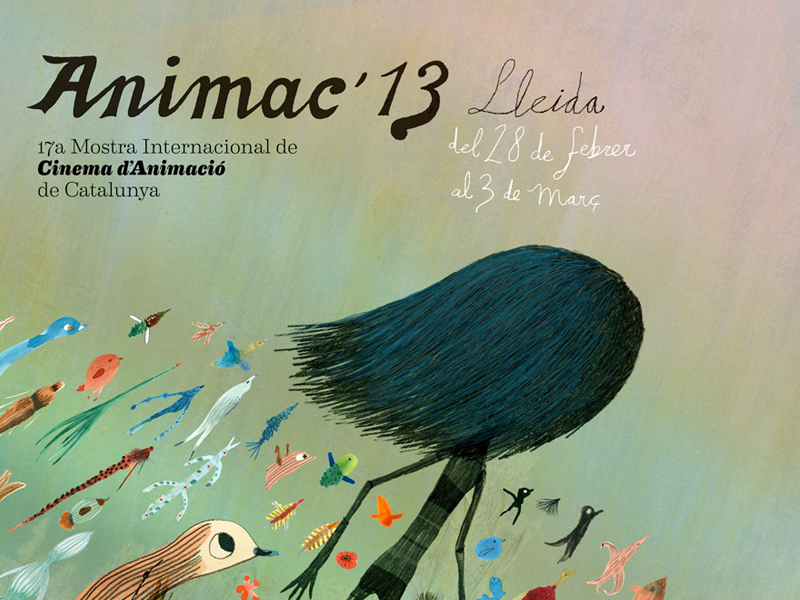 Animac is the International Animation Film Festival of Catalonia, and is organised by the City Council of the city of Lleida and the Government of Catalonia.It is a non-competitive festival that takes place in Lleida (Spain). 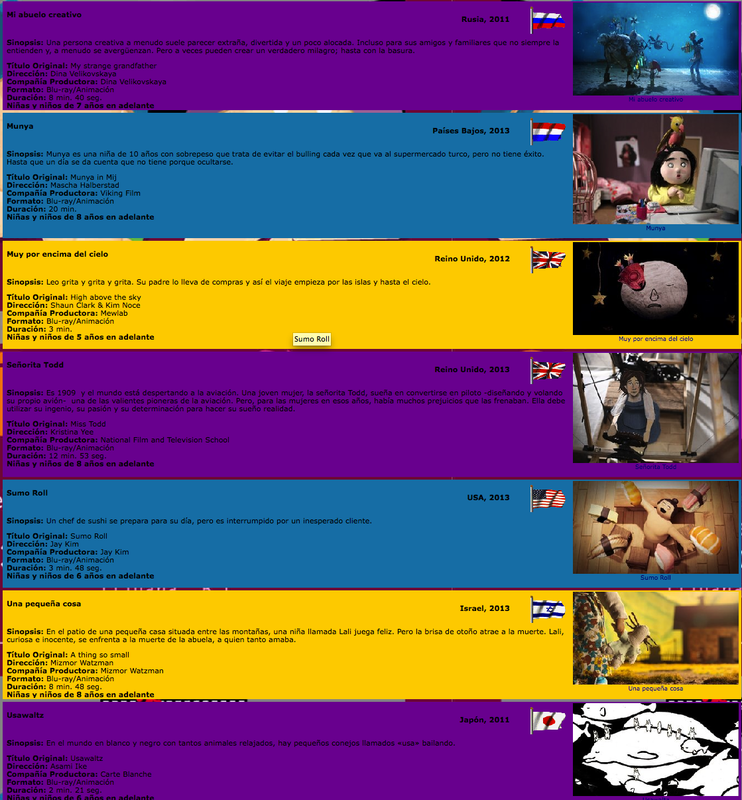 It shows a selection of the best animation done all over the world. Animac is the International Film Festival of Animation in Catalonia, and is organized by the Lleida City Council and Generalitat of Catalonia. Over the years, Animac has consolidated its independent and artistic character. Created in 1996 and throughout his nearly 16 years history has become one of the most popular audiovisual events held in Spain, with an important international presence and prestige. Nowadays Animac is a rigorous, dynamic and welcoming festival continually making efforts to improve, generating new audiences and attracting those who love animation. Animac is a non-competitive film festival aimed at artists who use animation as a tool for personal expression. We go beyond the limits of traditional narrative and we seek visionaries who make independent and daring works full of energy and who take their expressive potential to the limit. 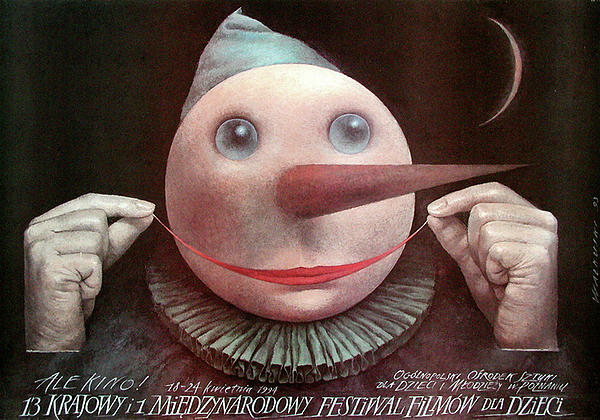 It was created in 1996 to celebrate the hundredth anniversary of the cinema. But it appeared with a different name: Cinemagic 96, International Animation Film Festival, under the direction of Eladi Martos and Jordi Artigas. This first edition was promoted by Lleida’s Cultural Department and the local Fine Arts School, together with ASIFA Catalunya. It is in 1997 when it takes the name of Animac, International Animation Film Festival, that changed still once more in 2006, into the definitive one: Animac, International Animation Film Festival of Catalonia. Landscape and Light is a selection of short films mixing strong drama with more experimental work, but bonded by a sense of the open landscape and cityscape, and the enclosed artificial light of rooms and darkened places. From the twinkle of London lights in both Night Peace and 80,000CHRISTMAS LIGHTS, to the frozen polar wastes in TRUE NORTH. Kate Dickie and Gary Lewis star in the Scottish highland drama THE GIFT. Plus some stunning animations. The London Short Film Festival, now in its 10th year, is recognised as the premiere UK showcase for cutting-edge UK independent film and Bafta recognised . Renowned for daring cross-arts programming, we showcase the very best of the country’s raw talent. The London Short Film Festival is a Mecca for the UK’s young creative talent and a significant date in the UK film calender. Every year the Festival’s large and loyal audience flock to screenings and events, and this network has grown steadily over almost a decade. 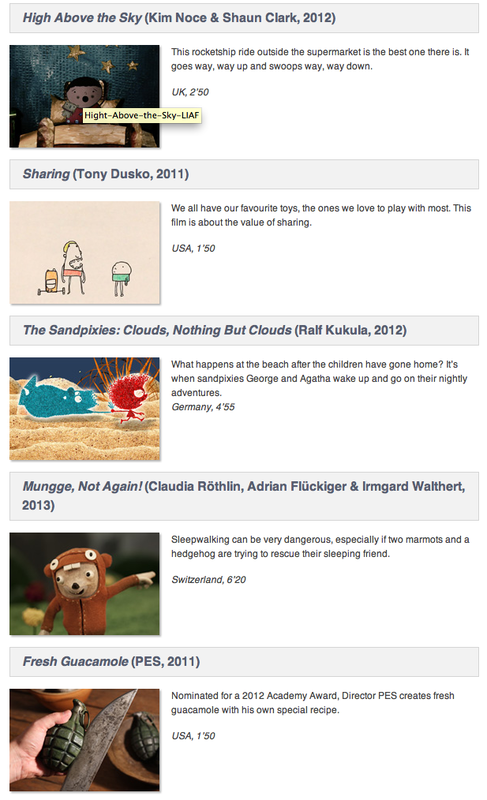 “High Above the sky” selected for Ale Kino 2012 in Poznan! If you have never been to Poznan two animation festivals you should try to go. Both the museum and the main square are delightful, and you wont find a warmer welcome anywhere else! In 2010 the Festival embarked on a tour around Poland. “Ale Kino! on Tour” is now available in little villages, whose young inhabitants seldom have the opportunity to encounter quality international film productions. 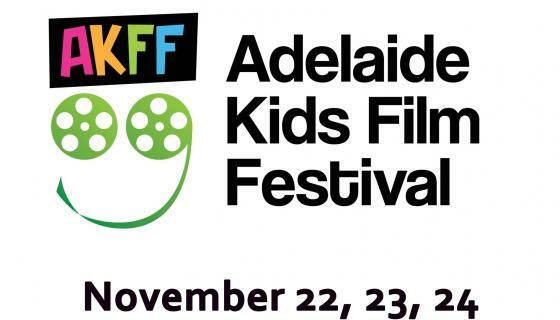 “High Above the sky” will screen at Adelaide Kids Film Festival on the 23rd November. We are delighted to announce that ‘High Above the Sky’ has been selected for the Colchester Film Festival 2012 official selection. Colchester Film Festival is an international short film festival showcasing the best short films from the UK and around the world. The festival will take place at the Firstsite Arts Gallery from the 5th to the 7th of October 2012. Screenwriter Julian Unthank who is currently writing NEW TRICKS for the BBC will be running a master class during the festival. We are delighted to announce that “High Above the Sky” has been selected for this years Witney Film festival. The festival takes place between the 23rd-26th October . “High above the sky” will screen on the 26th October in the grand finale of the festival which will also contain the “creme de la creme of short films submitted to this years festival”. 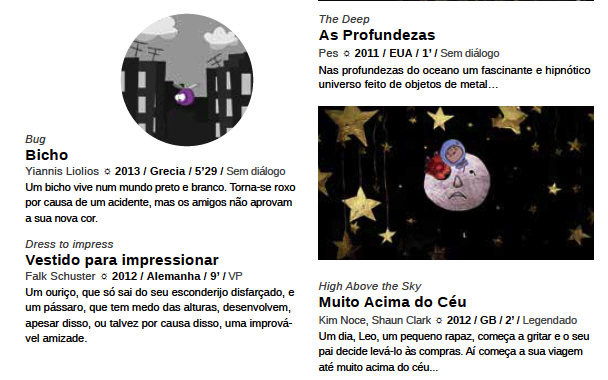 “High above the sky” will screen at this years Animage IV festival internacional de animacao de Pernambuco (brasil). The film is part of the official selection and will be screened between September 26th to 30th in Recife. 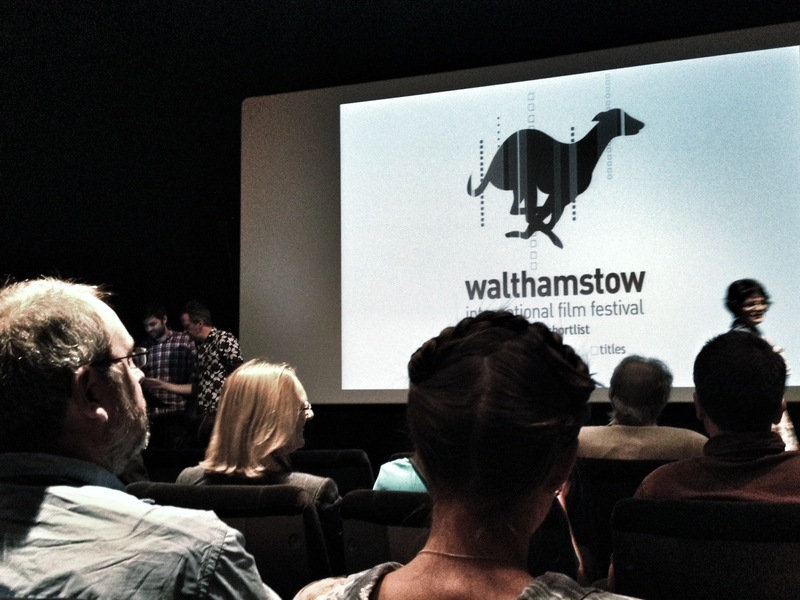 We are pleased to announced “High above the sky” will screen at Walthamstow International Film Festival. The film was co-directed by Shaun Clark and Kim Noce and has been short listed for the best animation award with a screening and award ceremony taking place at the BFI (British Film Institute) on The Southbank in Central London on Friday 7th September at 4pm. The winners will be chosen by a panel of judges including David Jenkins, film critic for Little White Lies, film producer Kate Vogel and local film director Barry Bliss. One of the Director (Kim Noce) and the Editor (Fiona De Souza) will present. The festival continues with further screenings on Saturday 8th and Saturday 15th September at the Vestry House Museum in Walthamstow Village from 1pm to 5pm and Sunday 9th and Sunday 16th September from 1pm to 5pm at Lotolie Family Hairdressers in Walthamstow Village in the basement. Mew lab are pleased to announce The Australian premiere of “High Above the Sky”. The film will feature in the Auburn International Film Festival.